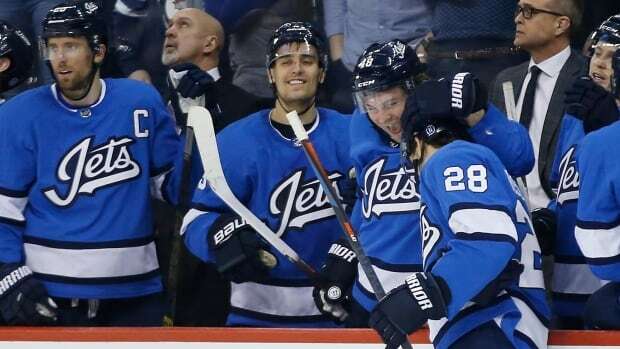 The Winnipeg forward had his first NHL career hat trick as the Jets scored a franchise-record six goals in the first period on their way to a 9-3 victory over the Anaheim Ducks on Saturday. Roslovic had left the morning skate because of cramps and was a game-time decision, but the third-year pro pumped in three goals on the power play and added an assist. Nick Ritchie, Daniel Sprong and Devin Shore scored for the Ducks (21-22-9), who’ve lost three straight and were beginning a five-game road trip. John Gibson only stopped eight of the 14 shots he faced before being pulled after Lemieux’s goal at 17:41 of the first period made it 6-0. Chad Johnson made 14 saves in relief. “Our personnel has to understand what happened tonight is unacceptable and we’re going to hold some people accountable to the way that they’re playing,” Ducks head coach Randy Carlyle said. “With ice time. They’re gonna sit in the stands. You know there are various ways to do it, but you know it’s one of those things that I never expected us to perform like we did tonight with the group that we have coming off of a nine-day break. Anaheim welcomed three players back from injury. Corey Perry made his season debut after undergoing knee surgery on Sept. 26. Patrick Eaves had been out 33 games because of a broken rib and Jakob Silfverberg had missed four games with a hamstring injury. Gibson was beat by a variety of shots: from a Roslovic breakaway, a Wheeler rebound, a Lemieux wraparound and a two-on-one with Little and Dmitry Kulikov, who was playing in his 600th NHL game. Little and Shore finished off the scoring in the third period.